It's not every day you see a Mariachi band dressed in full regalia at an Alpine ski lodge. 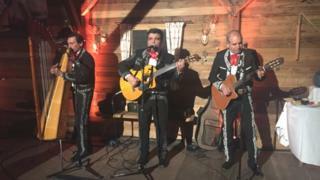 But Mexico Night at Davos is no ordinary event. An evening of tapas and tequila - this annual affair is organised by the government's international trade body, ProMexico, to promote the country's business interests at the World Economic Forum, and schmooze potential investors to the sound of "Besame Mucho". The guacamole is as good as any you'd find on a Mexico City taco truck, and the margaritas are as hard to resist as ever. Yet this is no ordinary year. The hospitality and party atmosphere belies a more hostile reality for Mexico, whose most important neighbour, the US, has just elected a man who promised to gut Nafta, the North American trade deal that has led to an unprecedented economic boom in Mexico. Now, more than ever, Mexico needs new friends. Leading the charm offensive is Francisco N Gonzalez Diaz, ProMexico's moustachioed director general - the man tasked with selling Mexico to the world. He flits around the room posing with dignitaries, and engages in brief but important-looking "bilaterals" (as they call them in Davos), with financiers in corners of the room. "We have very good friends, and you don't have to build new friends," he tells me, but adds, diplomatically: "You have to recover some of those… they are not lost… they are only [furnished] with bad information." Is he referring to the elephant in the room, President-elect Donald Trump? "I'm referring to those who don't believe in globalisation, who don't believe in trade, who don't believe in mutual investment," he proffers. That kind of measured language is common among Mexican business leaders attending this year's WEF, with many preferring to wait until the new US administration takes office to fire their first shots. Most would only speak to the BBC off the record, and are anxious about the future of their trade relationships. But all dismiss the idea that while Mexico has profited from globalisation, it has come at the expense of others, such as workers at US car factories. "No-one lost," says Mr Gonzalez Diaz. "The world has improved in all areas, and this means sometimes someone can run faster, but the idea is that everybody is gaining in this new globalisation game." That "G" word has certainly seen some criticism at Davos this year, most recently in a speech by British Prime Minister Theresa May. "So many friends have been talking about the need and the possibilities to encourage Mexico," he says, "to confront those guys who don't believe in globalisation." He cites Chinese President Xi Jinping, who emerged as the unlikely champion of free trade in his keynote speech at WEF, but also mentions BMW, Toyota and others. But remember, the worst is really the worst for the world, not only for Mexico. "They said: 'We believe in you, we believe in global markets, we believe in internationalisation, we are here with you.'" Digital screens around the Mexico Night party showcase some of the country's most recognisable global exports, such as Don Julio tequila, and Mr Gonzalez Diaz talks up the opportunities in other sectors, such as computer games, which are increasingly either developed or translated in Mexico for the growing Hispanic market. But in truth, as the "Mexico in your pocket" handbook laid out on tables makes clear, one of the country's chief exports is still cars and auto parts, and the US is their chief destination, by a country mile. Exports to the US totalled $308bn (£250bn) in 2015, compared to $10bn with Mexico's next biggest trading partner, Canada. If the worst happens, and Donald Trump does impose tariffs on cars coming over America's southern border, can Mexico weather the storm? "We [may by then] have developed a free trade agreement with China," says Mr Gonzalez Diaz, before sounding a warning: "But remember, the worst is really the worst for the world, not only for Mexico. Yet he adds, tellingly, "and we are developing new ones". Davos 2017: Is the urban-rural divide increasing?